We all know that regular care and maintenance is what makes our floors spotless and extends their life. Whether you have hardwood, tile, vinyl flooring, carpets or area rugs – it goes without saying that you need to regularly clean them so that they look perfectly good. What many homeowners don’t know, though, is the following…. When it comes to floor care and maintenance, the things you don’t do can be just as important as the ones you do. Meaning, if you don’t use a certain product for your floor – you may never see the best results and see it spotlessly clean. This is why today, we are writing this guide and listing the best floor care products handpicked from our floor care specialists. Because floor care is more than using a mop and water, we are listing the products in different categories – starting with mopping. This Floor Care and Cleaning Buying Guide for 2018 has few sections... Use the buttons below to quickly navigate to the type of dog food you are looking for today. The first thing that crosses our mind when it comes to floor cleaning is mopping. What every homeowner needs is a mop and a bucket – and the good thing is that there are so many different designs and products to choose from. Below, we are listing the best mop sets and accessories for successful mopping. First on our list is a great product from O-Cedar, a company specializing in floor care. This mop and bucket set is made from microfiber which puts your floor cleaning on a different level. The entire system comes with an exclusive bucket design with built-in wringer for hands-free wringing. With this mop set, you won’t have to dangle anymore or struggle when taking the (squeezed) mop out of the bucket. Instead, you can focus on deep cleaning and thanks to the microfiber formula, wipe away the dirt and grime from your floors. 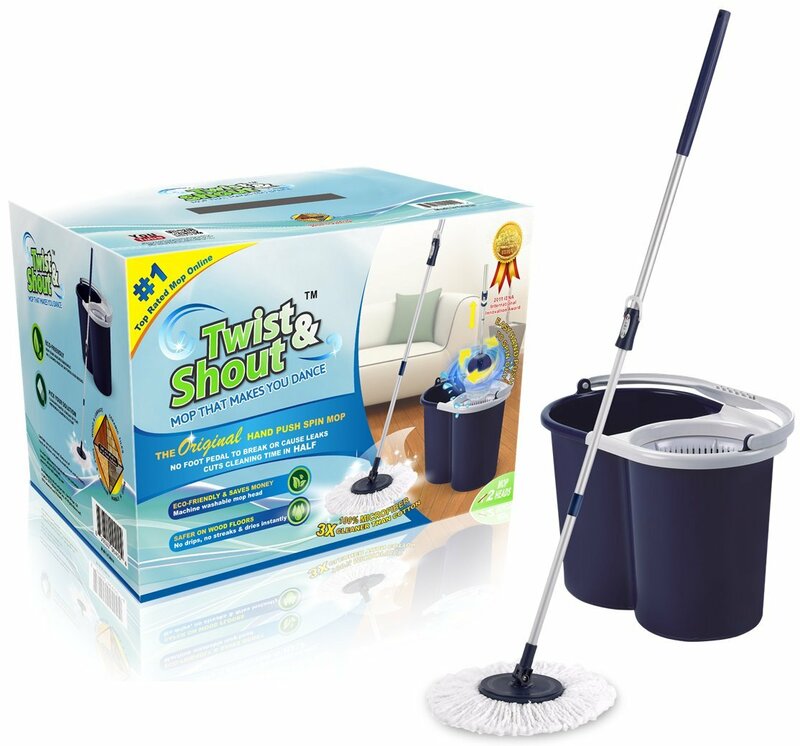 Thanks to the high-quality foot pedal, this mop set is one of the most innovative on the market and a bestselling product that is designed to active spin wringing, allowing the level of moisture to be controlled. So, the only thing you need to do is put the mop deep in the bucket, press the pedal – and off you go! Plus, you can use this floor care mop set either wet or dry. If you need a deep clean, you can use it wet – and if you need dusting your floors and other surfaces – you can use it dry. The mop pad is machine washable and removable with refills available online (the recommended replacing is every 3 to 6 months). Mopnado is another brand that will give you a cleaner floor faster than ever. With this mop system, you can clean all types of floors which is the key advantage of this set. Whether it’s hardwood, laminate, tile, vinyl, stone or concrete – you can make most of the durable microfiber mop head and wash it in the machine every time it gets dirty. 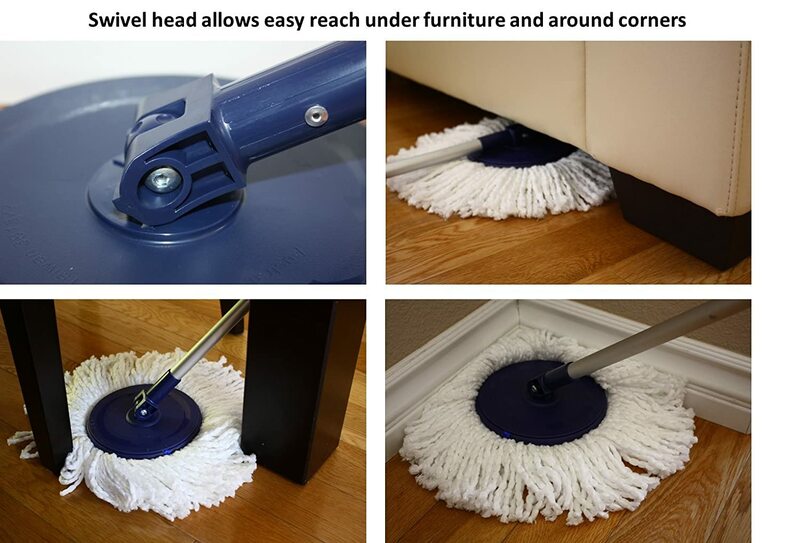 What’s great about this product is the 180-degree swiveling option which makes it easy to reach under furniture while the extendable 56-inch long handle will allow you to clean the windows and ceiling fans. As the brand says, this mop set is easier to use than any other on the market only because of the patented mop plates which make rinsing the mop easier than ever before. 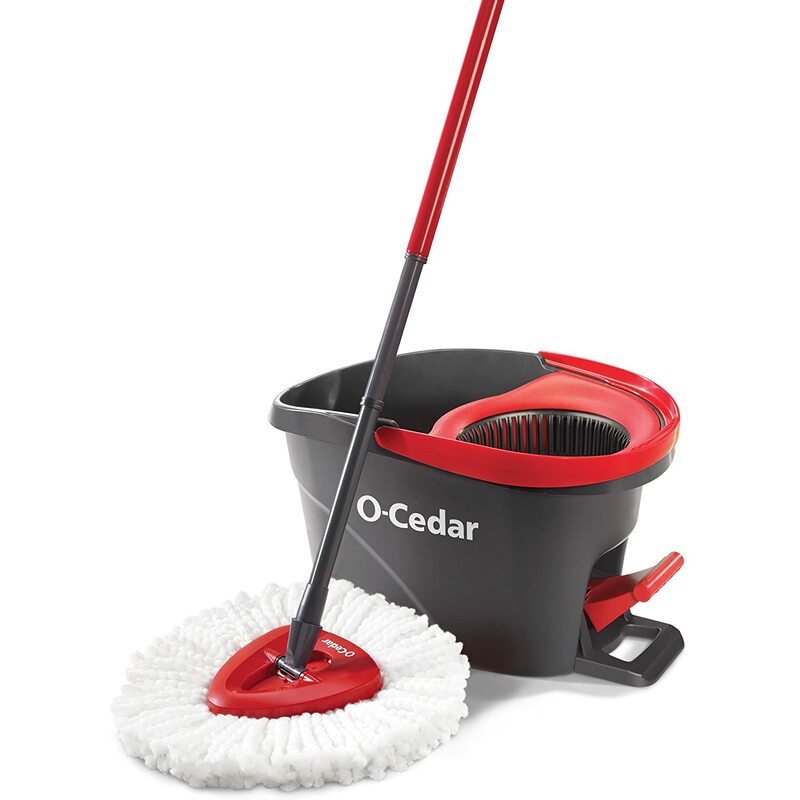 The Deluxe Model of this mop set also features large wheels and two handles for easy mobility while cleaning. Made of stainless steel, the spin dry basket is durable and long-lasting – just like the Mopnado handle which is constructed of the same material and backed by a 1-year warranty. 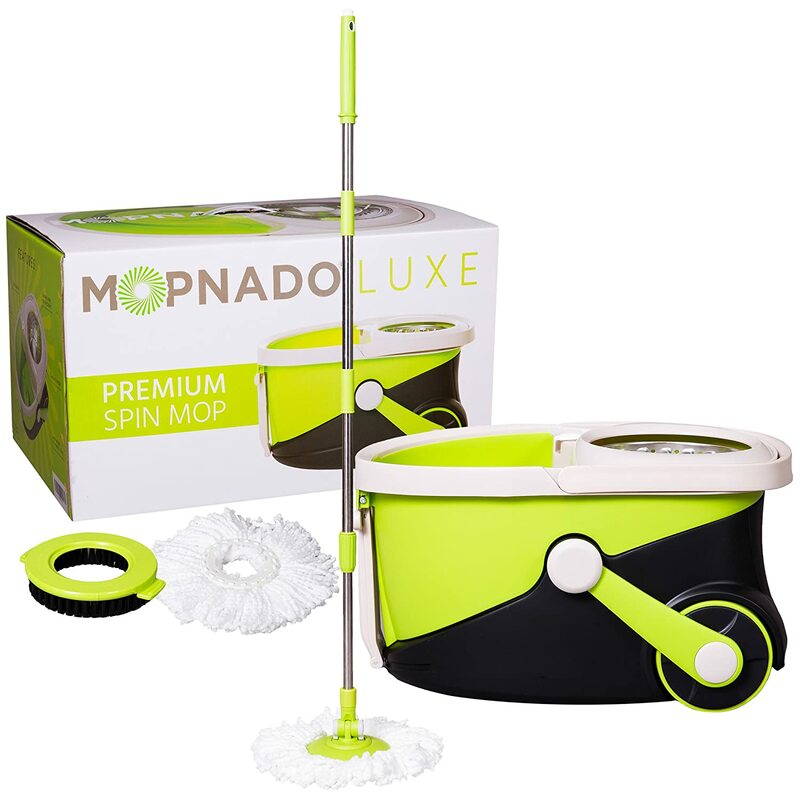 Mopnado is certainly a brand with innovative mop technology. According to many satisfied customers, cleaning the floor is a breeze and the entire mopping process is so enjoyable that it extends to cleaning windows, wooden surfaces and more. Basically, this model is unlike other spin mops. There is no foot pedal, no plastic spinning axis and no other unnecessary moving parts such as wheels, agitators and other that may break or cause leaks. The mop head here wrings two times drier than any foot pedal version and yet – this is the lightest bucket out of all spin mops on the market. This is what makes it easier to fill and dump water. The self-wringing mop easily spins dry with one gentle push on the handle. Speaking of, the handle will stay dry all the time without any bending – and will cut your cleaning time in half. While the swivel action pivots 180 degrees and rotates in 360 degrees, the 54-inch long handle dries instantly and can be used with removable mop heads (6-12 months is the recommended time of changing them). You can even use this product as a dry mop when picking up hair and dust. Now that you know what the top three mops and mop sets look like, it’s time to consider the liquid you are going to use when mopping the floor. As you probably know, choosing a good mop set is only half of the work when mopping – only because the other half lies in how good your floor care system is. To help you with this, we are listing the five best mopping floor care systems and products you can use on various types of floors. Care for the details? Read on! 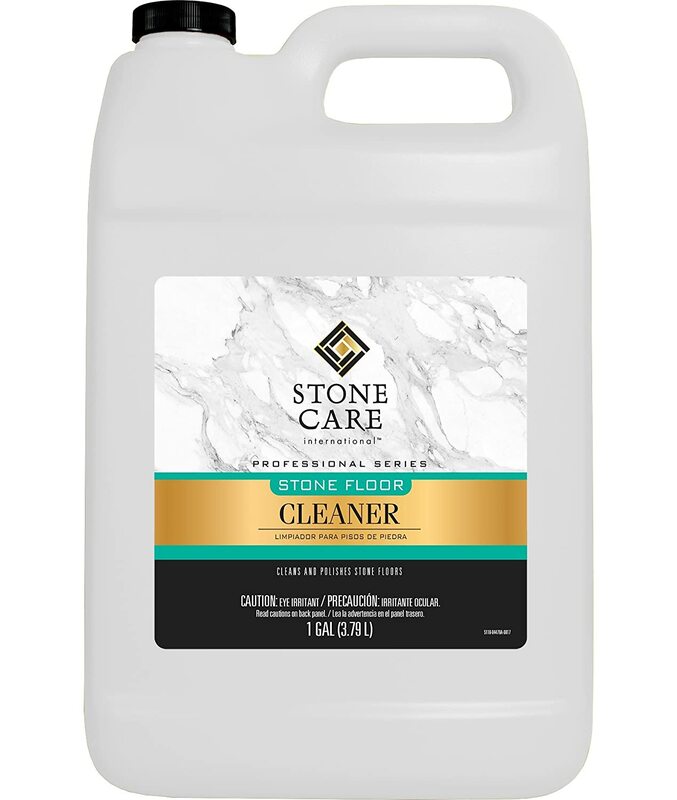 This concentrated stone floor cleaner excels when it comes to cleaning marble tile, granite tile, limestone, slate, terra cotta, grout, travertine, soap stone, flagstone and all the other types of modern stone floor tiles. It is ideal for residential and commercial use and uses a formula that requires no rinsing. The agent cleans well with no residue and leaves your stone floor looking bright and without too much shine. If you have lots of stone floors in your home, this is definitely a product you should consider. Next up on our list is a spray mop cleaner that leaves no dull or sticky residue. What’s great about this product is that there is no rinsing required and that it focuses on fresh, powerful and clean action. Basically, the process is simple – all you need to do is add ¼ cup of cleaner to one gallon of warm water and wash your floor as usual. There is no rinsing necessary. For any tough spots, you should use full strength and wipe with a clean and damp cloth. 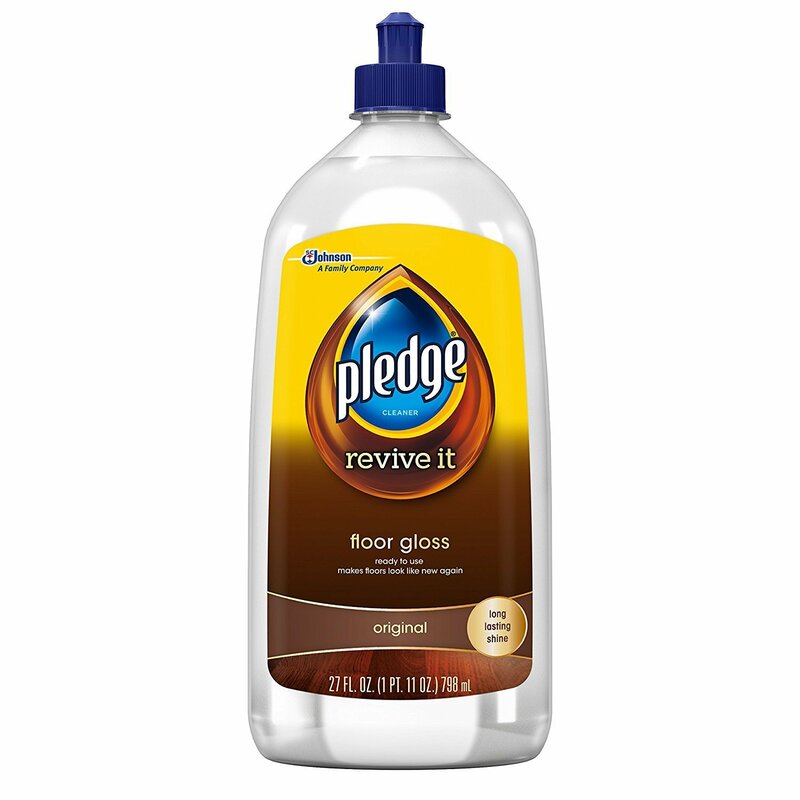 Pledge is another brand that excels when it comes to floor care – and this product proves why. The 27 oz. bottle can add a great value to your home. It is meant for any floor surface which is why it is practical, versatile and convenient. Also, it is important to note that this floor care cleaner is highly durable and very easy to use – leaving a glossy finish on your floors with a smell that is similar to furniture polish which is the best natural smell for any type of floor. The instructions on how to use it are shown on the package. 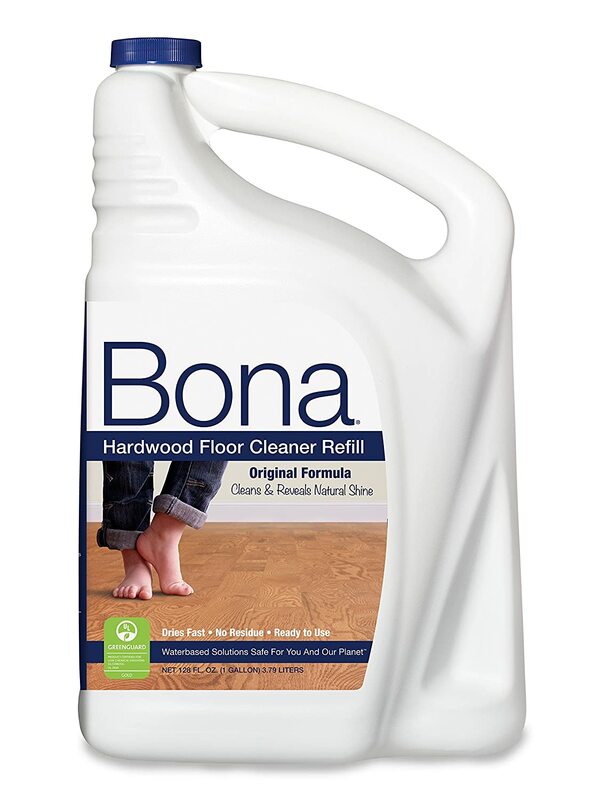 If you are looking for the ideal economy size bottle for a refill, the one by Bona will give your floor the splashless technology and insure a smoother pour. 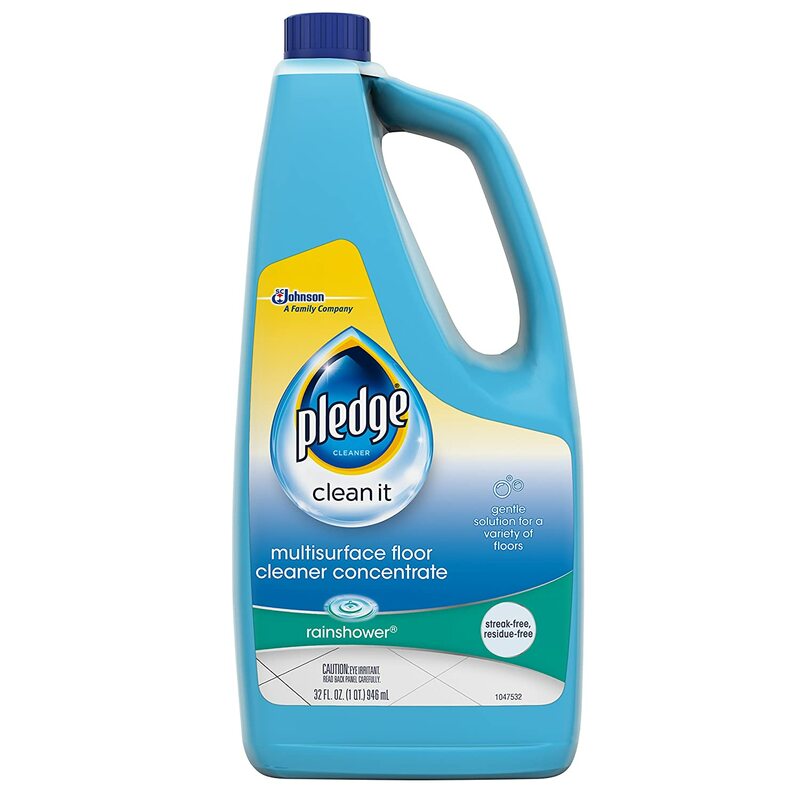 The water-based formula will dry fast and leave no dulling residue. According to many customers, this floor cleaner is safe for all unwaxed and polyurethane finished wood floors and doesn’t require any rinsing. The unique formula provides a complete clean by gently and effectively removing dust, dirt and grime. The product is also certified by Greenguard Gold which confirms that it is safe to use in your home and around the family. With nearly 100 years of heritage, this has been the go-to product for many homeowners around the world. Want to give your floors a quick shine? Just use the Quick Shine multi-surface floor cleaning agent for finishing and polishing your floors. The refill bottle comes in two standard sizes (27 oz. and 64 oz.) and is one of the best cleaners that protects, shines and polishes your floors. The application is very quick and easy. All you need to do is squirt the product on your flooring and spread with a mop. What’s left will be a deep, rich and long-lasting glow. The brand is used by many professionals for hardwood floor care for more than 55 years and is amazing when it comes to cleaning hardwood, laminate, vinyl, tile and stone floors. How To (Properly) Mop A Floor? By now, you have probably chosen a mop and floor cleaner for your needs. But have you learned how to properly mop your floors? Believe it or not, even the best of us are making mistakes when it comes to this. That is why below, we are listing a quick list with some of the best tips to mop a floor. Vacuum or sweep the floor before you begin mopping – This is very important because if you don’t do it, you may only make things worse and spread the dust and hair all around your home or office. Always follow the safety instructions on your cleaning product’s label – Read things carefully and reassure yourself that you have the best cleaning agent for your floor type. This is important if you don’t want to damage your floor. If you have a rag mop, mopping in a tight horizontal figure of eight works best and doesn’t leave any bits behind that you might have missed when vacuuming. Remember to rinse the floor with some fresh water once you finish mopping – This is not actually necessary with most of the floor cleaners out there – but may help you if you notice any strange smells or see sticky floors. Watch out – Make sure to wear slippers after you mop your floors – a clean floor can be too slippery for socks! 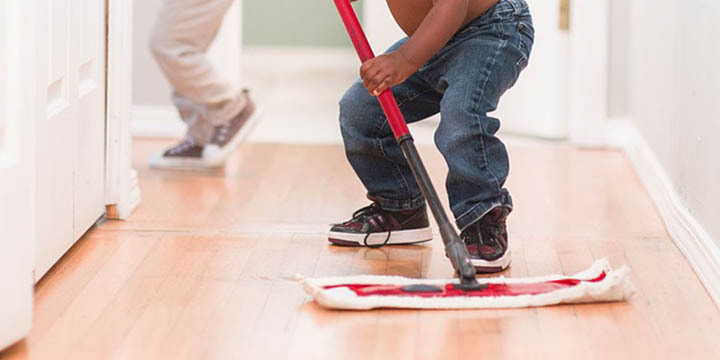 In the end, cleaning your floors happens more often than you imagine – especially if you have children or pets around your house or a lot of foot traffic in your office. Therefore, you should be more careful about the cleaning products you choose and the methods you use when cleaning. We hope that this guide helped you successfully clean your floor and equip your home with products that are meant to last!